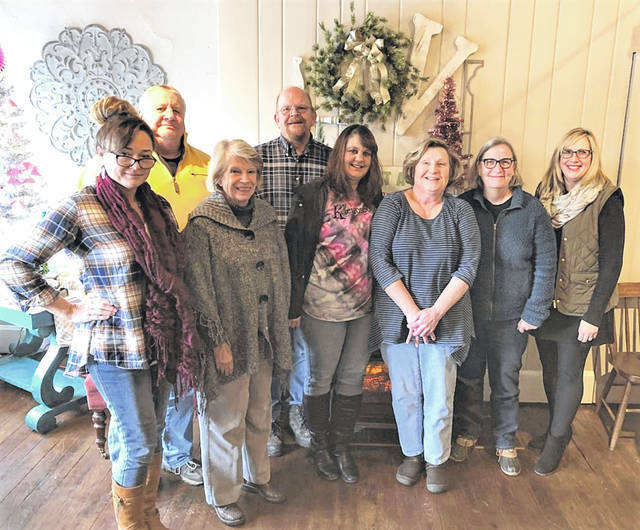 Pictured from left are Tina Blakeman, Vintage Traveler; Mike Manaloff, Oxner’s; Patsy Thackery, Cafe Paradiso; Brett Evilsizor, CACC; Michelle Smith, Kaleidescope; Linda Pastori; Suzanne McCoy, Fruit Salad; Tina Knotts, Let’s Eat Cake. On Saturday, Dec. 1, downtown Urbana will be aglow as merchants launch the first Downtown Urbana Candlelight Walk in support of the Cancer Association of Champaign County (CACC). Retailers recently met with Brett Evilsizor, Acting President of the CACC, to finalize plans for the event. The stores will be lit with luminaries, and during the hours of 4-7 p.m., each will have a promotion and donate a portion of their sales to the Cancer Association. In addition, Cafe Paradiso, Coppertop and Fusion restaurants will be participating. Oxner’s General Store, Community Thrift, Lily’s Garden, Fruit Salad, Let’s Eat Cake, PB&J on Main, Montego Designs, Unique Boutique, and Kaleidoscope are participating retailers. Other businesses, such as NaCl Salt Spa are donating items for raffle. Shoppers should look for the luminaries that will light the way and make the downtown festive. Evilsizor expressed his appreciation to the group. “The Candlelight Tour of Homes, which was cancelled this year, was one of the CACC’s major fundraisers,” Evilsizor said. “This organization was founded 40 years ago by five women who were volunteers for a major cancer society and saw many of the funds raised going outside of the community. They started the CACC to help people deal with the effects of cancer on their daily lives, and provide financial assistance for treatment, transportation, and medical devices. The money raised will stay in Champaign County, and help people in our community who are struggling with this condition.” The CACC traditionally has sold calendars at during their home tour, and this year Lily’s Garden, Oxner’s, and Kaleidoscope have volunteered to sell them during the month of December. Retailers are looking forward to meeting people who would have traditionally taken the home tour and enjoyed dinner downtown afterward. This fun, festive holiday event will be another way for the community to work together and raise money for this important local organization.